Emotional and physical space between you and another person. Place where you end and another begins and where you begin and another ends. Limit or line over which you will not allow anyone to cross because of the negative impact of its being crossed in the past. Established set of limits over your physical and emotional well-being which you expect others to respect in their relationship with you. Emotional and physical space you need in order to be the real you without the pressure from others to be something that you are not. Emotional and/or physical perimeter of your life which is or has been violated when you were emotionally, verbally, physically and/or sexually abused. Healthy emotional and physical distance you can maintain between you and another so that you do not become overly enmeshed, dependent or used. Appropriate amount of emotional and physical closeness you need to maintain so that you and another do not become too detached and/or overly independent. Balanced emotional and physical limits set on interacting with another so that you can achieve an interdependent relationship of independent beings who do not lose their personal identity, uniqueness and autonomy in the process. Clearly defined limits within which you are free to be yourself with no restrictions placed on you by others as to how to think, feel or act. Set of parameters which make you a unique, autonomous and free individual who has the freedom to be a creative, original, idiosyncratic problem solver. Financial limits on what you are willing to spend, donate or contribute. 1) Over Enmeshment: This symptom requires everyone to follow the rule that everyone must do everything together and that everyone is to think, feel, and act in the same way. No one is allowed to deviate from the family or group norms. Everyone looks homogeneous. Uniqueness, autonomy and idiosyncratic behaviors are viewed as deviations from the norm. 2) Disassociation: This symptom involves blanking out during a stressful emotional event or conversation. You feel your physical and/or emotional space being violated and you tell yourself something like: “It doesn’t matter.” “Ignore it and it will go away soon enough.” “No sense fighting it, just hang on and it will be over soon.” “Don’t put up a struggle or else it will be worse for you.” “God will fix this.” This blanking out results in your being out of touch with your feelings about what happened. It may also result in your inability to remember what happened. 3) Excessive Detachment and Disconnection: This symptom occurs when neither you nor anyone else in the group or family is able to establish any fusion of emotions or affiliation of feelings. Everyone is totally independent from everyone else and there doesn’t seem to be anything to hold you and them together in healthy union. You and they seem to lack a common purpose, goal, identity or rationale for existing together. There is a seeming lack of desire from you and the other members to draw together to form a union because you fear loss of personal identity. 4) Victimhood or Martyrdom: In this symptom, you identify yourself as a violated victim and become overly defensive to ward off further violation. Or it can be that once you accept your victimization you continue to be knowingly victimized and then let others know of your martyrdom. 6) Invisibility: This symptom involves your pulling in or over-controlling so that others, even yourself, never know how you are really feeling or what you are really thinking. Your goal is not to be seen or heard so that your boundaries are not violated. 7) Aloofness or Shyness: This symptom is a result of your insecurity from real or perceived experiences of being ignored or rejected in the past. This feels like a violation of your efforts to expand or stretch your boundaries to include others in your space. Once rejected you take the defensive posture to reject others before they reject you. This keeps you inward and unwilling or fearful of opening up your space to others. 8) Cold and Distant: This symptom builds walls or barriers to insure that others do not permeate or invade your emotional or physical space. This too can be a defense, due to previous hurt and pain, from being violated, hurt, ignored, or rejected. This stance is your declaration that “I’ve drawn the line over which I don’t want you to cross.” It is a way to keep others out and put them off. 9) Smothering: This symptom results when another is overly solicitous of your need and interests. This cloying interest is overly intrusive into your emotional and physical space. It can be so overwhelming that you feel like you are being strangled, held too tightly and lack freedom to breathe on your own. You feel violated, used and overwhelmed. 10) Lack of Privacy: This symptom is present when you feel that nothing you think, feel, or do is your own business. You are expected to report to others in your family or group all the detail and content of your feelings, reactions, opinions, relationships, and dealing with the outside world. You begin to feel that nothing you experience can be kept in the privacy of your own domain. You begin to believe you don’t have a private domain or your own space into which you can escape to be your own person. It also includes being interrogated and questioned about every move, decision, etc. These are just a few examples of unhealthy thoughts or beliefs which allow boundaries to be ignored or violated. Following each unhealthy belief is a more healthy, rational, realistic, reality-based affirmation for healthy boundary building. Unhealthy: I can never say “no” to others. Healthy Boundary Builder: I have a right to say “no” to others if it is an invasion of my space or a violation of my rights. Unhealthy: It is my duty to hold them together. Healthy Boundary Builder: I have a right to take care of myself. If they want to stay together as a family or group, it is up to each individual to make such a decision. They all have equal responsibility to create the interdependency needed to keep us a united group. Unhealthy: I can never trust anyone again. 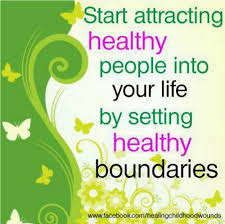 Healthy Boundary Builder: I have a right to take the risk to grow in my relationships with others. If I find my space or rights are being violated or ignored, I can assertively protect myself to ensure I am not hurt. Unhealthy: I would feel guilty if I did something on my own and left my family or group out of it. Healthy Boundary Builder: I have the right and need to do things which are uniquely mine so that I do not become so overly enmeshed with others that I lose my identity. Unhealthy: I should do everything I can to spend as much time together with you or else we won’t be a healthy family or group. Healthy Boundary Builder: I have a right and a need to explore my own interests, hobbies and outlets so that I can bring back to this family or group my unique personality to enrich our lives rather than be lost in a closed and over enmeshed system. Unhealthy: It doesn’t matter what they are doing to me. As long as I keep quiet and don’t complain, they will eventually leave me alone. Healthy Boundary Builder: I will never again allow my space and rights to be violated. I will stand up for myself and assert my rights to be respected and not hurt or violated. If they choose to ignore me, then I have the right to leave them or ask them to get out of my life. Unhealthy: As long as I am not seen or heard, I won’t be violated or hurt. Healthy Boundary Builder: I have a right to be visible and to be seen and heard. I will stand up for myself so that others can learn to respect my rights, my needs and not violate my space. Unhealthy: I’d rather not pay attention to what is happening to me in this relationship which is overly intrusive, smothering and violating my privacy. In this way I don’t have to feel the pain and hurt that comes from such a violation. Healthy Boundary Builder: I choose no longer to disassociate from my feeling when I am being treated in a negatively painful way so that I can be aware of what is happening to me and assertively protect myself from further violation or hurt. Unhealthy: I’ve been hurt badly in the past and I will never let anyone in close enough to hurt me. Healthy Boundary Builder: I do not need to be cold and distant or aloof and shy as protective tools to avoid being hurt. I choose to open myself up to others trusting that I will be assertive to protect my rights and privacy from being violated. Unhealthy: I can never tell where to draw the line with others. 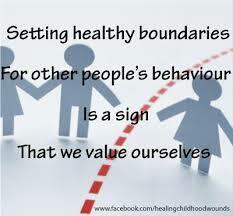 Healthy Boundary Builder: There is a line I have drawn which I do not allow others to cross. This line ensures me my uniqueness, autonomy and privacy. I am able to be me the way I really am rather than the way people want me to be by drawing this line. By this line I let others know: this is who I am and where I begin and you end; this is who you are and where you begin and I end; we will never cross over this line so that we can maintain a healthy relationship with one another. First: Identify the symptoms of your boundaries currently being or having been violated or ignored. Second: Identify the irrational or unhealthy thinking and beliefs by which you allow your boundaries to be ignored or violated. Third: Identify new, more rational, healthy thinking and beliefs which will encourage you to change your behaviors so that you build healthy boundaries between you and others. Fourth: Identify new behaviors you need to add to your healthy boundary building behaviors repertoire in order to sustain healthy boundaries between you and others. Fifth: Implement the healthy boundary building beliefs and behaviors in your life so that your space, privacy and rights are no longer ignored or violated. Step 1: In order to motivate yourself to establish healthy boundaries in your life, you first need to do a self-assessment if any symptoms of ignored or violated boundaries exist in your life. In your journal, record which of the following symptoms exist for you. For each symptom identified, detail what was the stimulus in your past for this behavior. Also detail how this symptom affects your current life. Lastly, describe how you feel about this symptom’s affect on your life. Step 2: Once you have identified the symptoms of your boundaries being ignored or violated and what the stimulus was for these symptoms, then you need to identify in your journal what unhealthy thoughts or irrational beliefs you have which led you to have your boundaries violated or ignored. Step 3: After you have the irrational beliefs and unhealthy thoughts identified, then in your journal write down affirmations which are healthy boundary builders. You will need these boundary builders as you begin to take steps to protect your rights, privacy and personal space. Step 4: In order to ensure your healthy boundaries are maintained, you next need to add the following behaviors to your healthy boundary builders repertoire. Each healthy boundary-builder behavior is linked to a respective Tools for Coping Series topic. To ensure the healthy boundary-building behaviors are in place, work out in your journal each of the “Steps to” sections of the boundary-builder behavior topics referenced. Step 5: Once you have complete acquiring the healthy boundary-building behaviors, then begin to implement them as you proceed in you relationships at home, work and in your community. If you find that you are still experiencing you emotional and/or physical boundaries being ignored, then return to Step 1 and begin again.